I’m going to reveal my secret to keeping at it. It’s a little bit upsetting, but I wonder how many of you do the same? I’m going to let you in on it in case it helps you with your trail running. You see, there’s a reason I don’t ring my boyfriend to pick me up halfway through a 15miler despite being frozen numb and wet through (last Saturday). Something makes me run those extra 8 miles when the rest of running club have finished our 12mile Long Steady Run (last Sunday). It forces me get my arse to circuits and running club (this tuesday,) run home from work in the dark (yesterday) and get up before sunrise to blast my lungs and legs up a local hill before work (this morning). So fed up of getting cold (cursing coach Rory for making me lose my 1.5 stone of body fat insulation!) I dressed like a scuba diver for this Wednesday’s run home. 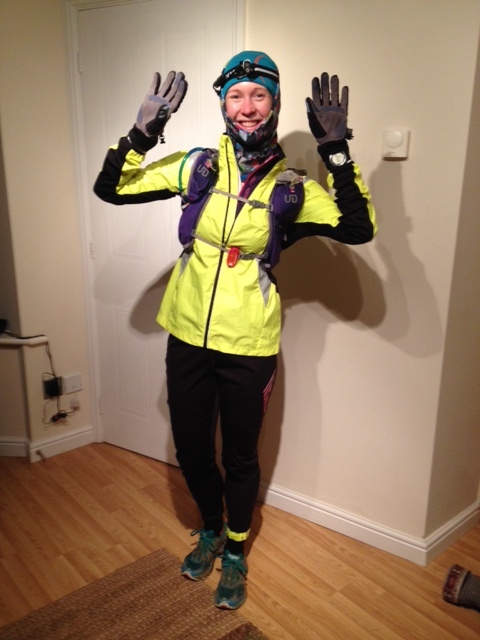 Windproof Helly Hansen tights and warm thermal, Sealskinz waterproof gloves, Marmot hat, the lot! Yes I got too hot. Yes, it’s partly down to my obstinate determination to stick to the tough training plan devised for my by coach Rory Coleman for the 6 marathons in 6-days Coastal Challenge Costa Rica, but once out, you need something else to keep your motivation up. Shamefully, I can find my brain moaning about how I don’t want to do it, how things hurt and how I can’t be bothered. ‘Can’t be bothered’ is the worst offender, it just doesn’t care! The secret to silencing this unhelpful voice (you’re going to do the training anyway, so why allow it to bleat?) is to think about those that can’t run. A girl in my friendship group, only my age, has a terminal illness, so I’m bloody well going to make the most of being healthy. At first it upsets me, then it fires me up and I just keep on running. Thank you to her for being my inspiration. What keeps you running? I use lots of other thoughts too, but this one has really helped at the toughest moments recently. Nothing I’m experiencing on a run could be worse than what she’s got going on. So I get on with it. Previous Previous post: I hate gels, but I found a great one!